Seven person band from Toronto, Canada. Active I'm guessing 2002-2004. 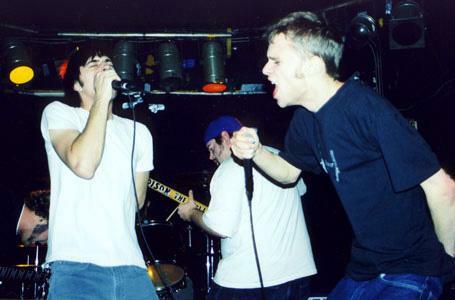 Played with a lot of the other popular Canadian emo/screamo bands. As for sound, they're a little bit different sounding. They almost kind of remind me of some European bands. I think this is all they've released. Their website hints at one other possible split, but I'm not entirely sure if it ever actually came out. That's about all I've got for this. Check it out, it's pretty unique from other stuff, at least posted on this blog. I cant wait for a corrosive melody! Me too! Would love to see their discography finally out there on the internet. and P.S. thanks for the shout out in your blog. I've been a big fan of both of your blogs over the years! Thanks man! I got some groovy stuff coming in soon just waiting on the right time to post. Keep me updated on that acm discog.